Less is more. But apparently luxury companies don’t feel that applies to their swollen store networks. Labels like Prada and LVMH have spent a decade expanding rapidly to meet emerging market demand. Slowing sales and overexposure suggest it’s time to go the other way. While cutting back will be painful, it could spur higher luxury valuations. The global market for luxury has ballooned in 10 years, mainly because of China’s rise. Storefronts have blossomed accordingly. Consider the tripling of Burberry’s retail locations over that time. Prada has more than doubled in size since 2009 – with 629 locations by 2014. Hermes is one of the few that has been conservative. It opened 65 shops since 2005 – or 26 percent growth over a decade. That has helped create new sales – but the numbers aren’t that impressive. Revenue growth at Burberry has been 226 percent, suggesting average annual growth of 14 percent, where store numbers have grown an average 13 percent. Prada’s sales have also kept pace with new openings, suggesting both relied heavily on additional shops to beef up their top line. Hermes snubbed the easy money and focused on organic growth. It’s the harder route but has made its store network far more efficient. A quarter increase in its retail footprint led to a near-tripling of sales from 1.4 billion euros in 2005 to 4.1 billion euros in 2014. Now that luxury sales are slowing, and falling in China, the maths works against the likes of Burberry and Prada. With their store networks at saturation, their old growth story is over. Hermes, though, is still forecasting 8 percent annual growth, even when the global market for personal luxury has slowed to 1 percent to 2 percent. The pace of expansion has also overexposed many luxury brands. Burberry has 17 stores in Hong Kong alone – that’s more than cheap fast-fashion Spanish label Zara. There is a glut of stores in China. Yet Chinese shoppers are now buying 70 percent of their luxury trinkets abroad, according to consultant Bain. It would be a brave move to abandon a decade-long habit of growth, but then as Coco Chanel once reputedly advised, “elegance is refusal”. 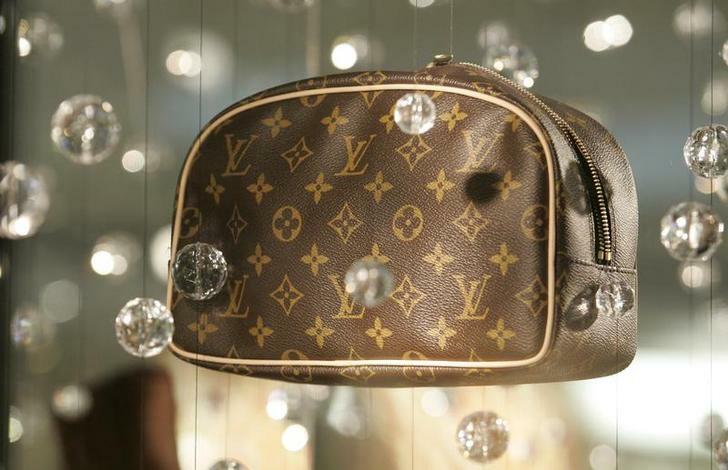 A luxury leather bag hangs on display in the window of a Louis Vuitton store as shoppers buy gifts on Christmas Eve at the Beverly Center shopping mall in Los Angeles, California.